A security guard checks cars at the entrance to Casa Padre, a former Walmart which is now a center for unaccompanied immigrant children on June 24, 2018 in Brownsville, Texas. Before President Donald Trump signed an executive order Wednesday that halts the practice of separating families who are seeking asylum, over 2,300 immigrant children had been separated from their parents in the zero-tolerance policy for border crossers. 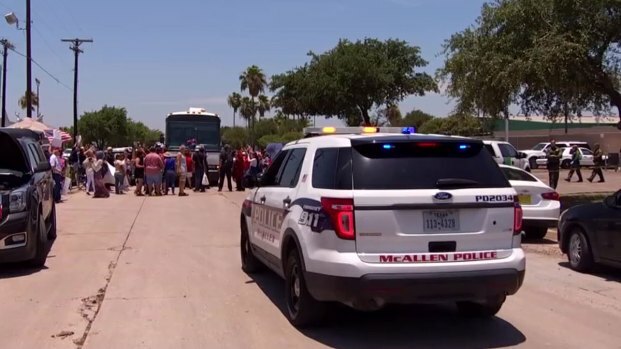 Police said Sunday that a 15-year-old boy ran away from the Texas shelter for migrant children, Casa Padre, NBC News reported. The boy had been in conversations to be reunited with a man whom he called his father, but details on the man weren't immediately clear. There was a discrepancy with a DNA test, and before it could be sorted out, the child ran away Saturday. A police source told NBC the boy is in Mexico and the man he calls his father is sending him money to get him back to Honduras. "As a licensed child care center, if a child attempts to leave any of our facilities, we cannot restrain them," Southwest Key said in a statement. "We are not a detention center. We talk to them and try to get them to stay. If they leave the property, we call law enforcement."